Cut the head of garlic horizontally, removing the top 1/3 and exposing the raw cloves. Set on a small piece of aluminum foil, drizzle with olive oil and sprinkle with salt and pepper. Wrap the aluminum foil around the head of garlic loosely and bake in a 375 degree oven for one hour. Unwrap and let cool. In a small bowl place the mayo, lemon zest and juice and then squeeze the roasted garlic cloves into the mayo mixture. Be careful not to get any of the garlic paper in the mayo mixture. Stir and season to taste with salt and pepper. Trim the bottom portion of the asparagus and discard. Place on a baking sheet and drizzle with olive oil and sprinkle with salt and pepper. Bake at 450 degrees for 4-6 minutes, depending on the thickness of the asparagus stems. Pierce with a fork to determine desired doneness and remove from oven. Remember there will be carryover cooking! 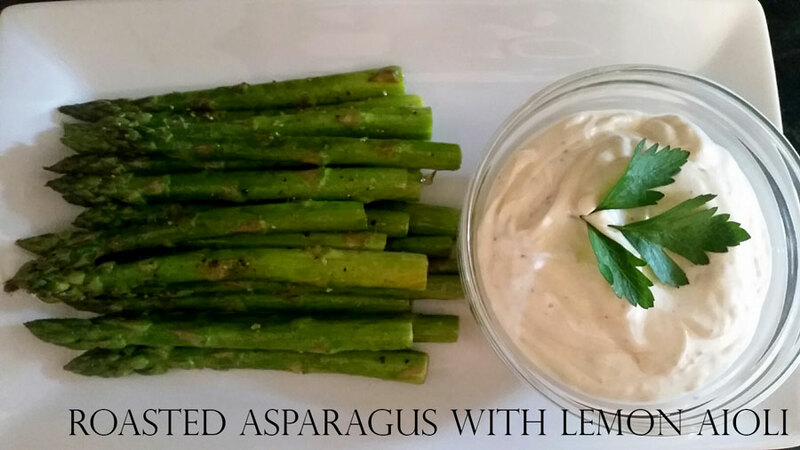 Place the asparagus on a platter and serve with the aioli as a dipping sauce.